The University of Wisconsin men’s hockey team (12-8-1, 5-2-0-0 Big Ten) continued their impressive play Thursday night, upsetting No. 8 Ohio State (12-5-6, 3-3-1-1) to mark their second straight victory over a Top 10 team. 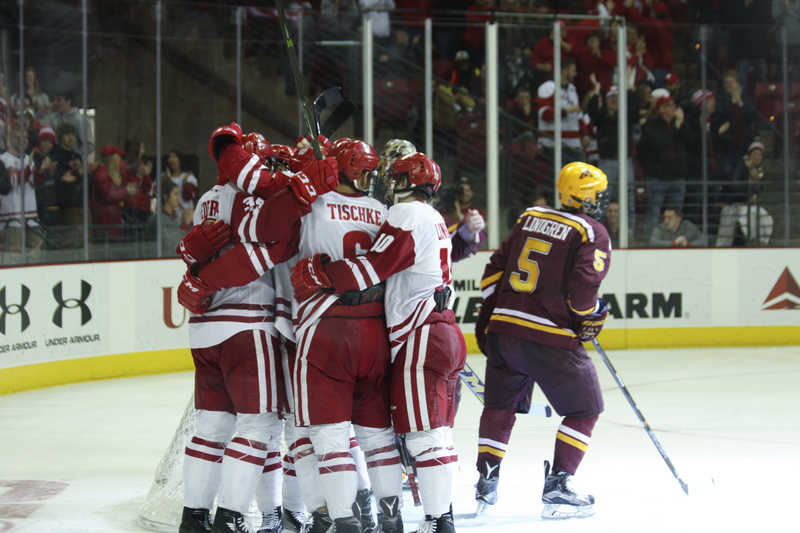 After an exciting weekend in which the Badgers split games with top-ranked rival Minnesota, UW looked to continue its strong Big Ten play in Columbus taking on the eighth-ranked Buckeyes. Wisconsin jumped out to an early lead, a nice response after they found themselves trailing at the end of the first period in both games last weekend. The breakthrough came just 3:24 in on a short-handed goal by captain Luke Kunin, his 15th on the season. The sophomore slotted home a beautiful centering pass from junior defenseman Jake Linhart to extend his point streak to seven games. It didn’t take long for the Badgers to add to their lead, as Cameron Hughes took advantage of a turnover 5:22 later by finding sophomore Matthew Freytag in the middle, who put it past Christian Frey for his second tally of the season. Wisconsin went into the second period on top 2-0, with freshman goalkeeper Jack Berry stopping a perfect seven of the seven shots he faced. OSU pulled back within one goal 4:28 into the second period with a score from Matthew Weis. The game would remain a one-goal contest for the rest of the period and most of the third, before Ryan Wagner put the game out of reach with an empty-net goal in the last minute. The Badgers defense and Jack Berry did well stifling the second-ranked OSU offense, who are averaging 4.09 goals per game this season. Berry finished the game with a .96 save percentage, stopping 26 of the 27 shots he faced to improve his record to 6-4-1 on the year. A nail-biter in New York on Sunday ended in a 3-2 Badger victory and a weekend sweep of the No. 8 Ohio State Buckeyes. After coming off the convincing 3-1 victory two nights before in Columbus, Ohio, the Badgers looked to make it two in a row over the Buckeyes under the lights at Madison Square Garden. Wisconsin got on the board first when senior forward Aidan Cavallini fired a beautiful wrister over the glove of OSU goaltender Christian Frey, giving the Badgers the 1-0 heading into the first intermission. The rest of the Super Saturday matchup would play out to be a defensive battle as both teams went scoreless in the second period and continued deep into the third. Early in the third, Wisconsin was awarded a five-minute major when OSU’s Josh Healey laid a brutal shot on Wisconsin senior Grant Besse, sending the star forward to the ice, where he eventually had to be helped off. The Badgers would add on an additional two minutes of penalty time when OSU committed a boarding penalty seconds later, but would lose their senior leader for the rest of the game. As the third period pressed on and the power play ensued, the Buckeyes thwarted every shot the Badgers threw their way, ending the Wisconsin advantage with the score locked 1-0. It wasn’t until five minutes remained in regulation when Badger sophomore forward Matthew Freytag found the back of the net with confidence to seal the deal for Wisconsin. The Buckeyes would not be denied so soon, however, as they jumped back into the game with a late power-play goal, cutting the Wisconsin lead to one. As the final two minutes of regulation ensued, the Buckeyes became desperate to even the score. Finally, with a man advantage, an empty net and 16 seconds left, OSU found the back of the net on a deflection to send the game into overtime. “We were sloppy for a while you know, holding onto a 2-1 lead and the bench looked at me as I was trying to deal out instructions and they were like, ‘Okay coach we got this, don’t worry we got this,’” head coach Tony Granato said. The Buckeyes were rolling heading into the extra time but the Badgers weren’t fazed. Neither team could find a hole in their opponent’s defense, and the Big Ten opponents battled it out until junior forward Cameron Hughes whacked in a rebound to end the game and give the Badgers the weekend sweep. 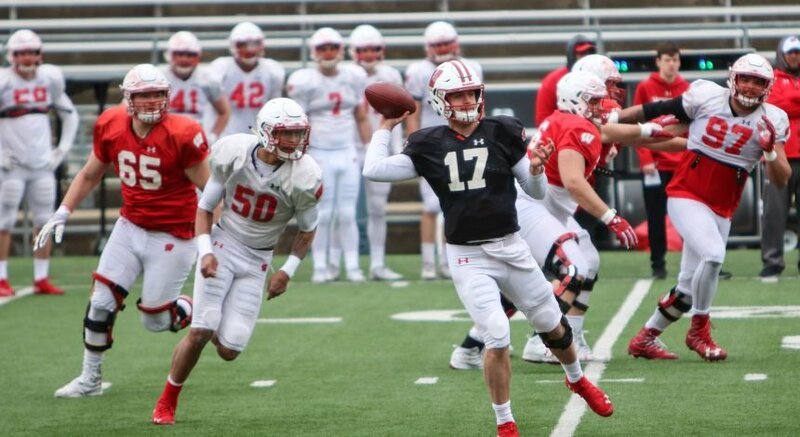 Wisconsin has every right to believe in themselves and their team as they have gone 6-2 in their last eight games, taking down two ranked opponents in Minnesota and OSU. In a high-flying Big Ten conference, the Badgers have proved they are here to stay. 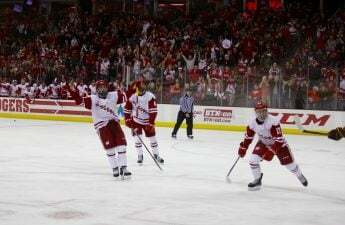 The win moved UW into a tie for first in the conference, solidifying the return of Badger hockey.